This type of call is quite common. Either a ‘care line’ company will receive an alert as someone has pressed their care pendant but not answered the phone, or a concerned neighbour is unable to get an answer from the door so calls us or the Police to check on them. 1) They are absolutely fine and probably pressed their pendant accidentally and are quite surprised to see us, or simply didn’t hear the neighbour knocking. 2) They have fallen on the floor or are unwell in someway and very relieved to see us and so were unable to answer the phone or the door and are very relieved to see us. 3) They have died and that’s why there was no answer and we are shocked and saddened to find them. We didn’t know the details of this call until we pulled up to a small lane, down which we could not fit our ambulance. We were met by a man in his 80’s who was the person whom had called 999. “Is it possible he’s gone on holiday?” I ask as we walk down the lane to his bungalow. “He’s a similar age to me and hasn’t been away for over 40 years!” He replies. As we approach the bungalow, which is all in darkness, I shoot my crew mate a look that she mirrors. We know that this will either be option 2 or 3 of the above. We also knock firmly on the front door but there is no answer. There is a key safe outside the porch but our control doesn’t have the code, neither dose the Police control room and neither does the neighbour. I walk around the perimeter to see if there is a back door or an open window I can squeeze through as my crew mate requests Police attendance to gain access to the property by force. All the windows are closed and back door is locked shut with security bars. We decide to send the neighbour home, promising that we will update him as to what the outcome is. We say it is because he can go and have a cup of tea and watch some TV in comfort, when in actual fact, if this man is dead and has been dead some time, we don’t want him to see it. We wait a little while for the Police, it’s a lower priority call for them and we know it so we don’t mind. All the while we shine our torches around to find a way in. The Police finally arrive and we fill them in to what’s happened. The too knock on the door and every window. I show one of them around the house to make sure that there is no other way in. The Police need to justify breaking someone’s door in and also need to do it in a way that is cheap to repair. “WHAT THE HELL ARE YOU DOING? !” Comes a shout from INSIDE the house!! We all look at each other, not sure what to say. “Uuuh, it’s the Police” one officer tries to explain. “Why are you banging down my door?” He retorts. “Your neighbour called 999 as he was worried you didn’t answer your door. We’ve been knocking on your door for nearly an hour” I say to try to reassure him. It doesn’t work. “How do I know you’re not burglars?” Fair point, we all think. The WPC offers her Police Warrant card through the letter box. He agrees that she is indeed who she says she is and tries to unlock the door. 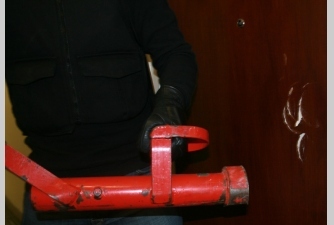 The trouble is, giving an old lock a solid hit with a battering ram throws the lock out of joint, meaning that the poor bloke can’t unlock the door! “I can’t get out, I shall die in here!” He shouts. “This is turning into a bloody nightmare” I think to myself. We persuade him to pass his key through the letter box, promising to give it back, to unlock it from the outside. We unlock and open the door and find the greyest most terrified man I’ve ever seen. He is most surprised to see 2 Ambulance Staff and 2 Police officers stood at his door. Truth be told, we’re most surprised to see him alive! Ever the optimists we are! It takes us almost 20 minutes to convince him we definitely are who we say we are, and to calm him down. Then he pulls out a notebook and reads this. “I thought it was a burglar.” He replies. We tried to convince him that if Police and Ambulance control know what the code is, we can access his property if he’s unwell, but he didn’t want us to have it. The Police made sure that he could secure his property, and we dutifully informed his neighbour that he was fine, explaining about the foxes. We shared a laugh with the Police about how ludicrous the whole situation was.